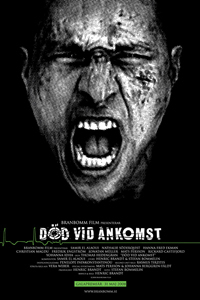 Work on Död vid ankomst took about 2 months, in order to create a total of 12 vfx shots that were assigned. It started out with cleanup work and transition fx, and culminated in creating CG webs & cockroaches to dirty up a room's appearence. A major piece of work also included to enhance the gore effects of the motion picture.